West Point is a place of both prestige and honor. Gaining admission to West Point is much more complicated than civilian colleges, though. How do you prepare to apply to America's Top College? West Point director of admissions Colonel Deborah McDonald will tell you. 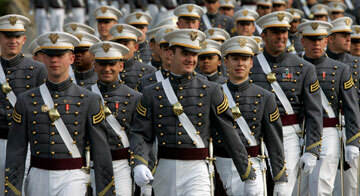 One of the five federal service academies, West Point has stringent admissions protocol. Luckily, Colonel McDonald walks you through the entire application process in the video below. Watch to learn not only how to apply to West Point, but also which courses to take in high school and how to meet the SAT or ACT requirements for admission. The essay and recommendation requirements for West Point are very different than civilian colleges, but Colonel McDonald will detail everything for you in her interview. Have you considered attending a military college, including West Point? We would love to hear your comments below.